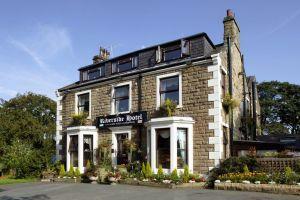 The Ilkley Riverside Hotel is perfectly placed for business or pleasure. The Dales Way walk starts at the Old Bridge, just outside the door. Friendly atmosphere and situated in a picturesque setting. Indoor swimming pool and Lido five minutes walk. Tennis Squash Court five minutes walk. Golf Course, horse riding nearby. Health Club is a five minute walk. Children welcome from any age. Take A65 to Skipton Road. Straight through traffic lights to crossroads. First right into Bridge Lane. Or A65 to Leeds, last left turn before crossroads. Ilkley Railway Station and Ilkley Bus Station are 200 yards from the Riverside Hotel.